One of my favorite childhood memories is sitting at the kitchen counter frosting and decorating cut out cookies. Mom would separate the dough into several bowls, coloring them blue, yellow and green. We helped her roll and cut out the cookies and then frosted and decorated them with sprinkles. My mom’s favorite sugar cookie dough is a recipe she has used for years from her friend Patty. This past Saturday the kids and I continued with this tradition and made a triple batch of cut out cookies. Mix butter, margarine and powdered sugar until fluffy, add eggs and continue mixing, add vanilla. Mix in flour and other dry ingredients until well combined. If you want to color some of the dough, divide it and put in separate bowls. Add desired food coloring and mix. Place each color of dough in a plastic food storage bag, flatten out so that it is easier to roll when chilled. Place bags of dough in the freezer. We left our dough for about 4 hours and then started rolling! Preheat oven to 350 degrees. Only take out the bag of dough you will be working with at that time! When dough softens it is very difficult to work with. Lightly flour work surface and start rolling dough. Turn dough over and continue to roll. Use desired cookie cutter and firmly place on dough pressing down. Cut out each cookie and place on cookie sheet. You can roll the dough very thin for crispy cookies or thicker for softer texture. At this point you can sprinkle some of the cookies before placing in the oven and leave some plain for frosting. Place in oven for 10-12 minutes depending on thickness of the cookies. Remove from oven and cool. 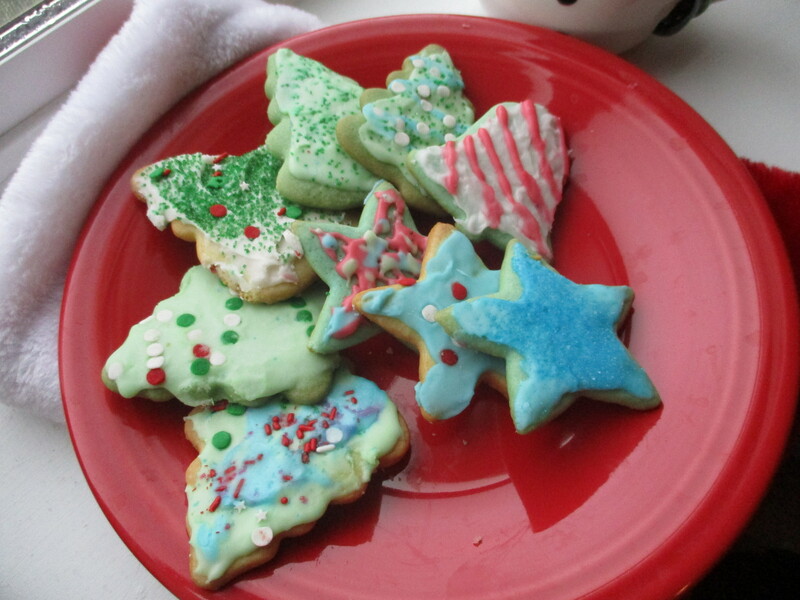 When cookies are cool, frost and sprinkle. Have fun!